To mark its 20th anniversary, EuroCham wants to celebrate the success of European companies and their contribution to growth, living standards and innovation in Vietnam. The EuroCham Business Awards 2018 will recognise the achievements of European companies in 5 categories: Business Excellence, Entrepreneurship, Alumni, Start-Up and Sustainability. The winners will be selected by an independent panel of judges composed by experienced professionals from diverse fields (see who they are below). 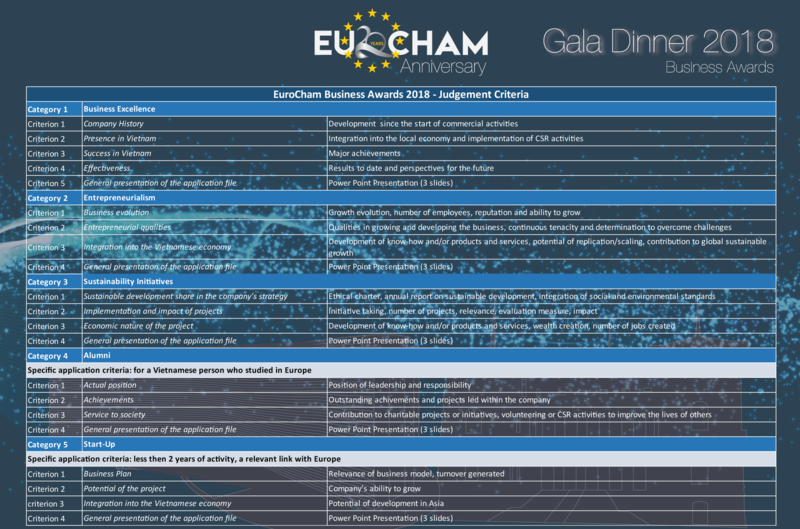 ARE YOU OR DO YOU KNOW A COMPANY THAT YOU THINK SHOULD WIN A EUROCHAM BUSINESS AWARD? NOMINATE THEM NOW! This award recognises the business that has shown long-term growth and success, been a model of responsible and profitable business and made a real contribution to Vietnam over the last two decades. This award recognises the business that has shown outstanding entrepreneurial qualities, such as being innovative, creative, disruptive and competitive, to overcome challenges and become successful in Vietnam. Vietnamese students educated in Europe get more than a degree. These students also bring back new ideas, connections and practices that benefit business back home. This award recognises the person who has made the biggest contribution to Vietnam after being educated in Europe. ﻿Vietnam is a magnet for start-up companies. This award recognises the most innovative, enterprising and forward-thinking new European companies. ﻿Vietnam's economic growth has improved education, living standards and opportunities for millions. But it is now creating environmental problems that threaten the health of its people and the future of its natural environment. This award recognises the business that has done the most to adopt sustainable practices and reduce its environmental impact. Alain Cany has been Country Chairman of Jardine Matheson Vietnam since 2007. Before moving to Jardine Matheson, he was President and Chief Executive of HSBC in Vietnam from 2003 to 2007. Alain also sits on the Boards of Siam City Cement Vietnam and Vinamilk. Alain has been Chair of the Vietnam Business Forum (VBF) from 2012 to 2014, and Chairman of the European Chamber of Commerce in Vietnam (EuroCham) from 2005 to 2012, representing international business in Vietnam. In 2011, he was awarded a Certificate of Merit by the Prime Minister of Vietnam, and also a Friendship Medal by the President of the Socialist Republic of Vietnam. He was also awarded a Chevalier de la Legion d' Honneur (Knight of the Legion of Honour) by the President of France in 2002 and Officer of the French National Merit Order. Phi Van Nguyen holds an MBA from Australia majoring in marketing communication. Her experience spans over 20 years as a senior executive in brand, retail, and franchise development across global emerging markets in Asia, The Middle East, Africa, and Eastern Europe. Phi Van is currently co-founder of World Franchise Associates, chairwoman of Retail & Franchise Asia, and investor of a portfolio of Asian startups. She is also franchise advisor to the Malaysian & Saudi Arabian government, board advisor at the Asia Pacific Chief Marketing Officer Council (CMO), and chairwoman of Saigon Innovation Hub. Phi Van is 2015 award winner of Retail Leadership presented by Asia Retail Congress, and 2017 award winner of 100 Top Great Retail Minds presented by World Retail Congress. ﻿She is the author of four books, "Franchising – The Short Route to Global Markets", "Cross The Rice Field, Reach The World", "Global Citizen Handbook - Version 4.0", and "Go Global: An MSME's guide to global franchising"
Dr Marko Seppä is Co-Founder and CEO of Global Enabler Corporation, a Finland domiciled community, platform and factory for high-impact business creation. Between 2015 and 2018 he helped the Vietnam-Finland Innovation Partnership Program IPP select Vietnamese start-ups for growth funding, trained university trainers in Entrepreneurship & Innovation, and launched a Vietnam market access program for companies from Finland. In Vietnam, he has also served in start-up juries for HATCH FAIR, Startup Day, WECREATE, Junior Achievement, and Frontier Targeted Innovation Challenge. He currently serves as Jury Member of European Innovation Council for EU's SME Instrument Program. Tomas Benz studied Industrial Engineering at Karlsruhe Technical University in the southern part of Germany. In 1990, he acquired his PHD in mechanical engineering at the same university (KIT). From 1990 until the end of 1999 he worked as head of IT Department in Industry. Until July 2018 he worked as a Professor lecturing in Business Information Systems at Heilbronn University of Applied Sciences. Since 2010 he has worked for VGU as a lecturer and Program director for the master program Business Information Systems at Vietnamese-German University. He was part of the German flying faculty coming for short-term lectures to Vietnam. In August 2018, he was appointed the president of the Vietnamese German University.